A $5,000 scholarship and tickets to Super Bowl XLIX are on the line for two CIA student teams. Earlier this month, four student teams prepared tailgate dishes for a panel of judges—including CIA graduates Anne Burrell ’96 and David Burke ’82, as well as Jets player Nick Mangold. Their finished dish needed to incorporate at at least three PepsiCo products. Including brands such as Frito-Lay, Gatorade, Pepsi-Cola, Quaker, and Tropicana—they had a variety of ingredients to choose from and each team put a unique spin on the challenge. Matthew F. Johnson from Duluth, MN and Cullen Folks from Atlanta, GA, who created Tostitos Chipotle Chicken Tacos. This dish is served in a grilled flour tortilla with Tostitos Salsa and Pepsi-marinated chicken and sides of a Sabra Guacamole-based salsa verde and Sierra Mist red cabbage slaw. Marie Taccino from Dallas, TX and Olivia DeSalvo from Broomall, PA, who created Naked Chia Cherry Lime Pork Sliders, topped with Pepsi-candied bacon. The dish is served on a homemade Quaker Oats and Fritos biscuit with a side of Muller Tropicana Slaw. 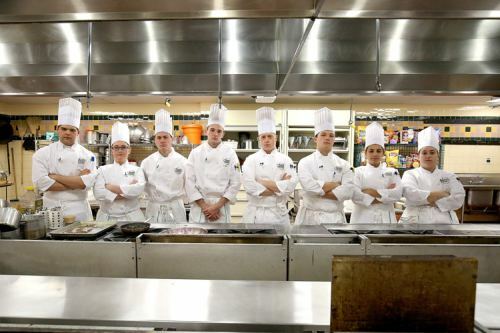 Is this competition the start of great things for these CIA students? Matthew F. Johnson is considering a career in food-related media: “To see Anne Burrell struggle with some lines tells me I can do it. You don’t have to be perfect. It’s great to have this opportunity now as a CIA sophomore.” But his partner, Cullen Folks, isn’t sure that the camera limelight is for her. “I really just want to be in the kitchen and in the zone. I really want to be down and dirty on the line,” says Cullen. Combine their talents and they’re sure they make the perfect team!